B is for Bats | True story. Really. Posted on April 2, 2016	by True story. Really. There are almost 1,000 bat species worldwide, and bats make up a quarter of all mammal species on earth. Other bats eat fruit, nectar, and a few eat small animals. South America is home to the famous (but tiny and mostly harmless) vampire bat. Bats can be found almost everywhere in the world except at the north and south poles and in extreme deserts. Some (but not all) bats use echolocation – emitting a sound and then waiting for it to bounce back to them – to find their way around, find food, and avoid predators and mid-air collisions. Some species are solitary, and others form colonies. Some colonies have a million or more individuals. A baby bat is called a pup, and most litters consist of just one pup. Bat wings are an example of pentadactyly, or ‘five-fingered-ness,’ meaning that a bat’s wings are structurally similar to human’s hands or a dog’s paws. Their very long fingers – and the membrane that stretches between their fingers – give them wings instead of hands or paws. While some bat populations number in the millions, many are in decline. A disease called White-Nose Syndrome has killed over six million bats in the US since 2006, and continues to be a threat to many bat populations. Find more bat info (because you can never have enough bat info) here and here. 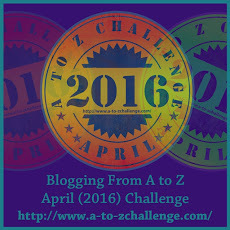 Video | This entry was posted in Challenges, Videos and tagged #atozchallenge. Bookmark the permalink. That bat is so cute. I love them, but I hardly see any now I don’t go night fishing with the husband. When we do spot one flying over the garden, its always very special. I don’t get to see them in person too often either, and it’s such a treat when I do. Thanks for visiting and commenting! I am not a lover of bats. That picture made me cringe! Off to a good start with the A to Z! Oh, sorry to hear it! I know they are not universally popular. Thanks for visiting and commenting, though! I hear bats flying around but I’ve never seen one around here. Another fact for you is that bats are the only native mammals in my country – New Zealand, apart from sea mammals like whales and seals. I found you! Thanks for the visit and the natural history lesson!